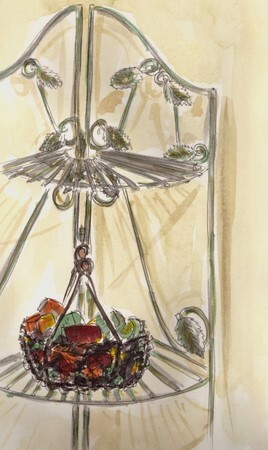 by Myfrenchkitchen.In home, objects, pen, sketchbook, wash, watercolour.Leave a Comment on Come on, just do it! Five things from my bathroom. Carole said so. (http://www.carolekirk.com/ I could only get to four. I struggled almost the whole day, but I’ve done it and I feel good. Great they are not, but I’m happy. Wonderful feeling of achievement! It was so great having someone tell me: “This is what you need to do, do it” Not thinking or planning or finding something…I just did it. Next time it will be better. Thank you, Carole. Good for you! There are some lovely touches in those sketches too. The shine on the pitcher, the shadow on the stand, etc. Enjoyed looking at them! Fabulous, I just Love your technic, so light and fresh but with great depth and personality – GREAT! Hey! Good work. I just love how you do those watercolour washes. You have such a light touch. The chair and bowl/pitcher is particularly nice. Looks like you’ve got a beautiful bathroom there! Gosh, each one is a winner! Just wonderful! Fantastic!! 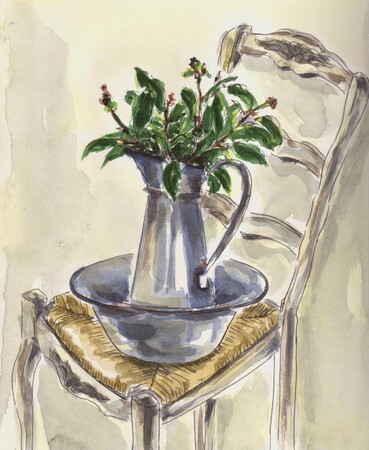 My fav is the chair with the pitcher and bowl and plant–what luscious lines and soft colors. By George, I do believe you’ve got your groove back!! These all have such elegance and beauty. It looks like you’ve found your inspiration again! What a spectacular comeback! My favourite is the chair with basin and pitcher. Goodness, if I tried to find inspiration in out bathroom it would spin me into instant depression – not the finest room in our house! Wow, these are beautiful sketches. 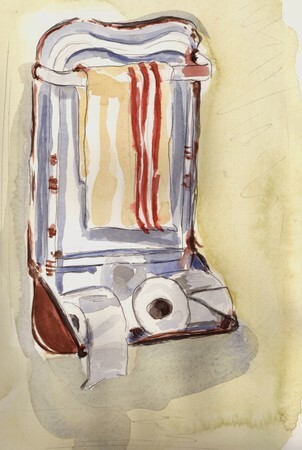 If not for the toilet paper rolls and towels sketch, I will keep on forgetting that these are paintings of your bathroom! Lovely! What great style you have. YEAH!! AND WHAT A GLORIOUS JOB YOU DID!!!!! Hope it broke your uninspired spell and that Madam Muse is sitting on your shoulder! I love the stuff in YOUR bathroom! Thank you for the comments…I am back to working, almost repeating everything twice in order to get something that is half decent, but that is OK.
i’m away on holiday and hadnt been to your blog in a while. lots of wonderful work since I last visited and these 3 from your bathroom are super too. Lovely little sketches. What an elegant bathroom you have, Ronell! Your watercolour style is very distinctive. And you’re so prolific! Ronell, these are beautiful! You’ve combined your wonderful drawing skills with your decorating talent and it’s a great combination. 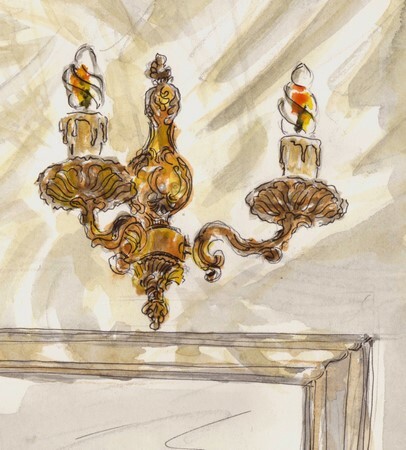 Wow, the chandelier is lovely and the reflections really make this a great piece. I love all the intricate inked lines. Once again, beautiful sketches! Love the light best of all.